The phrase “data is the new oil” sums it up perfectly. Raw materials like railway steel, motorway concrete, labor and oil were the critical raw materials for the economy in the last century, and data is the equivalent input for the 21st century. Any company expecting to thrive (or even survive) in our new connected economy must learn how to generate, capture and leverage data to create digital analytics and applications that can digitally evolve their businesses. And this includes label companies. Of course labels are still very much physical things and still need traditional printing expertise, equipment and processes to create value. However, they now also exist in a world dominated by software and real-time data rather than hardware, and label companies must adapt. As today’s leading companies—from Amazon, Apple, Facebook and Google to Uber, Netflix and Airbnb—know: survival requires developing new business models based on real-time data driving logistical excellence, detailed knowledge of their customers and the layering of digital services around physical products. Many major consumer brands have figured this out and are transforming themselves accordingly. An apparel brand like Under Armour, for example, has realized that consumers are increasingly demanding fitness apps, information about their health and branded experiences, metamorphosing the physical product into a platform for connected data, content and services. At EVRYTHNG, we believe that the label and packaging industry is a critical piece of this transformation. Labels and packaging are the digital bridge between the physical product and a cloud-powered universe of real-time data and software applications—a “jumping off point” for services in the supply chain through to retail, consumers and beyond. If label companies don’t figure out how to answer the call and transform their labels into smart, digital assets, then they’ll be out-maneuvered and out-competed by those who do. So do label printers need to become programmers? Not when they can subscribe to a Platform-as-a-Service like EVRYTHNG—just like a company might buy in cloud software capabilities like Salesfoce.com for CRM. This does all the heavy-lifting for you and hides the complexity of the technology in a service that makes it easy to turn ordinary labels into “smart labels.” You don’t need data centers or developers; you just need web programmers who can use software APIs (Application Programming Interfaces, organized processes for drawing down on 3rd party cloud capabilities, for example enabling people to use their Facebook IDs to login to your site) to build apps for their product labels as easily as they would build mobile web pages. And this is exactly why companies like EVRYTHNG exist: to make leveraging this technology simple so label companies and consumer product manufacturers can rapidly and easily digitize their physical assets and reap the business benefits. A third of the firms listed in the Fortune 500 in 1970 had been acquired, merged or broken up by 1983. Countless companies have learned the hard way what happens when you miss dramatic shifts in your industry and don’t react to change. It’s time for label companies to pivot their business models—and seize the opportunities of the smart products revolution. This piece was originally published by FINAT. 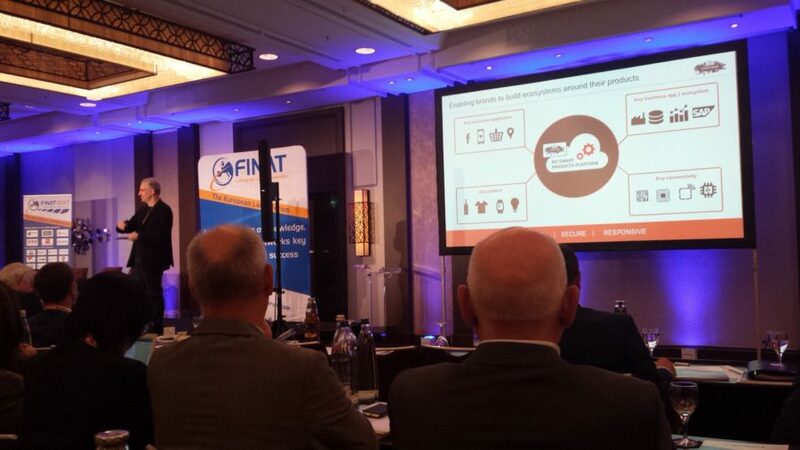 Andy spoke at the FINAT European Label Forum on June 8, 2017.